On January 4, 2001, our planet made its annual closest approach to the Sun. January 4, 2001 -- This morning at 5 o'clock Eastern Standard time (0900 UT) Earth made its annual closest approach to the Sun -- an event astronomers call perihelion. Northerners shouldn't expect any relief from the cold, however. Although sunlight falling on Earth will be slightly more intense today than it is in July, winter will continue unabated. "Seasonal weather patterns are shaped primarily by the 23.5-degree tilt of our planet's spin axis, not by Earth's elliptical orbit," explains George Lebo, a professor of astronomy at the University of Florida. "During northern winter the north pole is tilted away from the Sun. Days are short and that makes it cold. The fact that we're a little closer to the Sun in January doesn't make much difference. It's still chilly -- even here in Florida!" 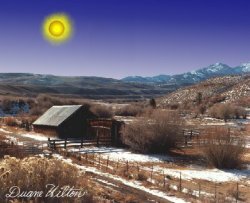 Right: Duane Hilton created this view of the perihelion Sun shining down on a snowy scene in central California. Don't stare at the Sun at perihelion -- it can blind you just as it might at any other time of the year! Seasons are reversed in the southern hemisphere. When the north pole is tilted away from the Sun, as it is now, the south pole is tilted toward it. As a result, summer is in full swing south of the equator even as northerners are bracing for a long winter. This morning at perihelion both hemispheres were 147.5 million km from the Sun. That barely differs from the greatest distance, 152.6 million km in July, which astronomers call aphelion. Perihelion always occurs near January 4th, while aphelion lands near the 4th of July. Earth's distance from the Sun doesn't change much throughout the year, but there are measurable differences in solar heating that result from our planet's slightly elliptical orbit. "Averaged over the globe, sunlight falling on Earth in January [at perihelion] is about 7% more intense than it is in July [at aphelion]," says Roy Spencer of the Global Hydrology and Climate Center in Huntsville, AL. "The fact that the northern hemisphere of Earth has more land, while the southern hemisphere has more water, tends to moderate the impact of differences in sunlight between perihelion and aphelion." Sunlight raises the temperature of continents more than it does oceans. (In other words, land has a lower heat capacity than water does.) In July (aphelion) the land-crowded northern half of our planet is tilted toward the Sun. Aphelion sunlight is a little weaker than sunlight at other times of the year, but it nevertheless does a good job warming the continents. In fact, say climate scientists, northern summer in July when the Sun is more distant than usual is a bit warmer than its southern counterpart in January. Most planets follow orbits that are more elliptical than Earth's. Pluto's orbit, the most eccentric of all the planets, is so lopsided that Pluto is sometimes closer to the Sun than Neptune is. Pluto's latest 20-year stint as the eighth planet --rather than the ninth-- ended in February 1999 when the diminutive world crossed Neptune's orbit on its way back to the outer solar system. NASA scientists hope to send a probe to the retreating planet before Pluto's thin atmosphere freezes and falls to the ground. Right: The orbits of Mercury (red), Earth (blue) and Mars (black). The solid lines indicate each planet's elliptical path around the Sun. The dotted lines show circular paths with the same mean separation from the center. Earth is almost exactly the same distance from the Sun at aphelion and perihelion, but the orbits of Mars and Mercury depart significantly from a circle. For more information, please visit Bridgewater College's Interactive Planetary Orbits web site. After Pluto, Mercury and Mars have the most elliptical planetary orbits. The eccentricity of Mars's orbit has a big impact on the Red Planet's seasons. Northern summer on Mars lasts 24 days longer than northern winter because the planet is close to aphelion during the summer. Planets move more slowly at aphelion than they do at perihelion (see Kepler's 2nd Law of planetary motion) and, so, seasons occurring near aphelion last longer. Northern summer on Earth is ~5 days longer than northern winter for the same reason. It's a difference that goes largely unnoticed on our planet, but it's unmistakable on Mars. During the long northern Martian summer, so much carbon dioxide frost at the planet's north pole sublimes into gaseous form that the northern summertime air pressure increases by ~30%. The Martian atmosphere literally waxes and wanes with the seasons -- all because of the planet's elliptical orbit. Back on Earth, aphelion and perihelion are just two ordinary days on the calendar. There's no danger that our atmosphere will freeze and fall to the ground at aphelion, or that perihelion will herald a smothering blast of carbon dioxide. Sometimes there's just no substitute for a circular orbit! Notes: 1 AU, the average distance from the Earth to the Sun, equals 93 million miles or 150 million kilometers. The eccentricity of a planet's orbit measures how much it departs from a perfect circle. Orbits with zero eccentricity (e = 0) are circular; orbits with eccentricities close to 1 (e ~ 1) are long and skinny. Planetary orbits tend to be almost circular while comets and many asteroids follow more eccentric paths.